This has been one of the worst summers for the country and Belgaum as well. 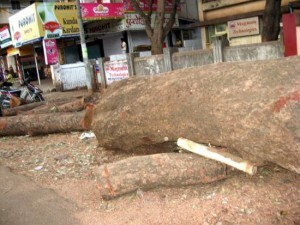 Trees have been cut all over the city for road development works. Even tough there were some voices raised against it none of them were heard. Now to top the icing on the cake towards deforestation and global warming, the state forest department has formulated a proposal to amend the Karnataka Tree Preservation Act, allowing expansion of a list of trees that are exempted from its purview. With 11 trees being exempted from the Act now, one would need no prior permission for felling them. The forest department now proposes to have 41 trees in the list. Activists of various environmental organizations, under the aegis of Belgaum Active Citizens’ Forum (BACF), will stage a protest demonstration in front of the Forest department today at 4 pm. The amendment means giving license to civic authorities, infrastructure developers, timber contractors, miners and others to cut the enlisted trees at will. Save Vaccine Institute (Belgaum), Paryawaran, Parivartan, Social Justice Forum, Belgaum Walkers’ Club, Multiple Varsity Student Circle are supporting the protest. Even state wide demonstrations have been planned by the various Green brigades today.